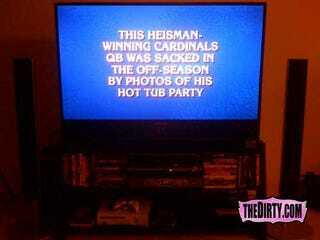 This question was featured last week as part of Jeopardy! 's "College Championship" week. Does this mean that the photo of Matt Leinart beer-bonging his way to infamy has reached a certain level of news relevancy? Or, does it mean that somebody on Jeopardy! 's staff lives in Scottsdale and just reads the Dirty.com all the time? It appears this world of ours is becoming smaller and smaller everyday.